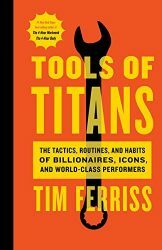 “For the last two years, I’ve interviewed more than 200 world-class performers for my podcast, The Tim Ferriss Show. The guests range from super celebs (Jamie Foxx, Arnold Schwarzenegger, etc.) and athletes (icons of powerlifting, gymnastics, surfing, etc.) to legendary Special Operations commanders and black-market biochemists. For most of my guests, it’s the first time they’ve agreed to a two-to-three-hour interview. This unusual depth has helped make The Tim Ferriss Show the first business/interview podcast to pass 100 million downloads. “This book contains the distilled tools, tactics, and ‘inside baseball’ you won’t find anywhere else. It also includes new tips from past guests, and life lessons from new ‘guests’ you haven’t met. “I don’t view myself as an interviewer. I view myself as an experimenter. If I can’t test something and replicate results in the messy reality of everyday life, I’m not interested. “Everything within these pages has been vetted, explored, and applied to my own life in some fashion. I’ve used dozens of the tactics and philosophies in high-stakes negotiations, high-risk environments, or large business dealings. The lessons have made me millions of dollars and saved me years of wasted effort and frustration.